Available now from Pace Press and Quill Driver Books (imprints of Linden Publishing). Somebody wanted Minerva Rus dead. They succeeded. But Minerva isn’t letting a little thing like death stop her. In Memortality, the first book of The Memortality Saga, young Minerva Rus discovered that she had the Gift, the power to bring the dead back to life, reuniting her with her long-lost love Raven, but also plunging her into unimaginable danger. Because Minerva is not the only one with the Gift, and the power of resurrection can also bring back long-dead evil, with fatal results for Minerva. 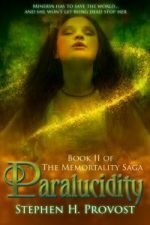 Now, in Paralucidity, the second book of The Memortality Saga, Minerva’s adventures continue postmortem, with even higher stakes — the fate of the world. After the dangerous adventure that killed her, Minerva has reconciled herself to being dead. She’s enjoying her romance with Raven and the companionship of the friends she has made — Carson, the taciturn secret agent, and Amber, the confident, self-assured doctor who has appointed herself Minerva’s big sister. The renegade government operator Jules, Minerva’s worst enemy, has been banished from reality and trapped in her own mind. It seems like Minerva is free to enjoy the eternity of her unnatural life. But immortality isn’t safe. Minerva and Raven’s life-giving powers mysteriously fade, forcing them to take refuge in The Between, a shadowy realm of memories that lies between life and death. What’s more, their old adversary Jules is on the loose, partnered with a resurrected Nazi scientist planning a monstrous experiment that will change the destiny of the human race. And now it’s up to a 21-year-old dead girl to save the world — again. Audience: Contemporary fantasy readers from young adult to adult. About the Author: Stephen H. Provost is a journalist and author. He has worked as an editor, reporter, and columnist at newspapers throughout California. He is the author of Fresno Growing Up: A City Comes of Age 1945–1985, a history of his hometown; Highway 99: The History of California’s Main Street; and Memortality, the first book in the contemporary fantasy Memortality Saga. It's our goal to make sure you are completely satisfied with your purchase. If within 30 days of purchase you are not satisfied for any reason, you may return your purchase for a full refund (excluding postage). Or we can arrange an exchange for a new product. We can only accept returned products that are in good condition. Ship returns to Linden Publishing, 2006 S. Mary St., Fresno, CA 93721. If you have any questions regarding returns, exchanges, or refunds, please call 1-800-345-4447. Copyright 2019 Quill Driver Books. All Rights Reserved. Developed by Plumb Web Solutions.